Alex Ekwueme is dead – Royal Times of Nigeria. Nigeria’s former Vice President of Nigeria, Dr Alex Ifeanyichukwu Ekwueme, is dead. He died at the age of 85. 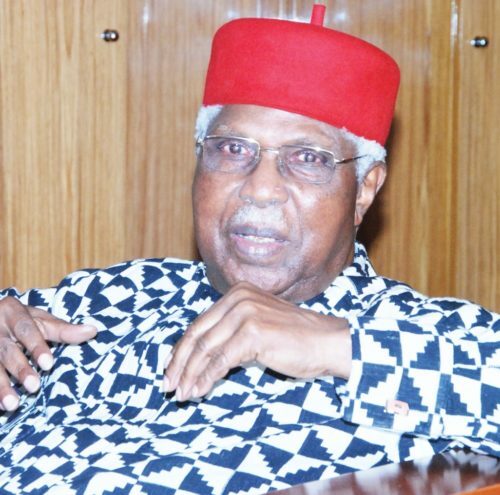 His brother and the traditional ruler of Oko in Anambra State, Igwe Laz Ekwueme, said the former Vice President, died by 10:00pm in a London clinic, on Sunday. In a statement, he said: “Ekwueme family regrets to announce the peaceful passing away of their patriarch, the former Vice-President of the Federal Republic of Nigeria Dr Alex Ifeanyichukwu Ekwueme GCON. The 85-year-old architect was the first elected Vice-President of Nigeria. He served in office from 1979 to 1983. Several weeks ago, he slumped in his Enugu residence. He was immediately taken to the Memfys Neurosurgery Hospital Enugu, where went into coma. As soon as he was stabilised in the hospital he was flown to London in an air ambulance last week, as ordered by President Muhammadu Buhari. Ekwueme who was Vice President to President Shehu Shagari was ousted in a coup staged by military officers led by Brigadier Muhammadu Buhari on 31 December 1983. He attended the University of London; King’s College; Lagos, Nigerian Law School; University of Strathclyde and University of Washington. He is the Ide of the Oko kingdom in Anambra State, where his younger brother, Lazarus, is the traditional ruler. He was also honoured by the council of Traditional Rulers in the old Aguata as the Ide of Aguata Local Government Area of Anambra State comprising forty-four (44) towns. Ekwueme is a distinguished architect who started his professional career as an Assistant Architect with a Seattle-based firm, Leo A. Daly and Associates, and also with the London-based firm Nickson and Partners. He worked briefly with ESSO West Africa, Lagos, overseeing the Construction and Maintenance department. He founded Ekwueme Associates, Architects and Town Planners, the first indigenous architectural firm in Nigeria.